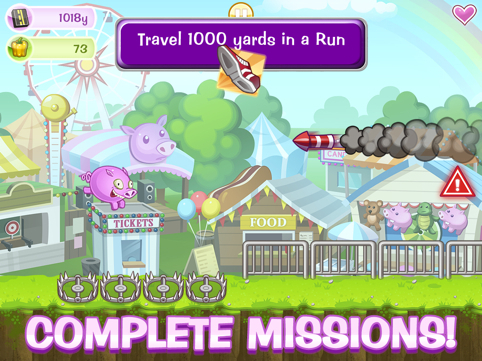 Help a pig escape the county fair in Glu's endless runner. If Jetpack Joyride kept you entertained, there's a great chance Glu Mobile's Ham on the Run will do the same. Available for iPhone and iPad, this endless runner challenges you to keep a cute little pig constantly running towards the right side of the screen gathering vegetables and terrorizing chickens. Since it's free, you can expect opportunities to spend money via in-app purchase, though in a rare and welcome twist, you don't need to open your wallet whatsoever. Definitely a welcome change from the norm. To be fair, Ham on the Run plays almost exactly like endless 2D runners that already take up residence on the App Store. The pig charges forward, and you simply tap the screen to make it jump. There are, however, subtle differences that help Ham on the Run stand out, beginning with those aforementioned chickens. Jump on four in a row without touching the ground, and the screen changes color and more veggies appear. It's a small yet cool bonus feature that gives you something else to think about while dodging bear traps, rockets, flying cars and pits, among other hazards. On top of that, earning a certain amount of veggies lets you purchase tickets to spin a prize wheel, whereupon which you stand to win game changing items like the Halo (revive from your next death), the Jet Engine (700 yard pre-run boost) and Carpet Pig, which basically drops the swine on a flying carpet; you can absorb one hit while on the carpet, pogo-stick and tractor. In addition, you can splurge on a variety of upgrades, such as a Veggie Vacuum that lets you harvest from a greater distance, and a Hover Pig that helps the pig catch big air. Other times, you'll just score extra vegetables. Nothing wrong with that. What makes this game so much fun, aside from the user-friendly controls and addictive gameplay, is the fact that you'll amass a sizable number of veggies from just playing Ham on the Run, instead of having to bust out a credit or debit card. There's never a wall that impedes your progress, similar to all those kingdom building games. On the flip side, it's very obvious that Glu intended to create a Jetpack Joyride-style game of its own, and that meant playing by that title's rules. Ultimately, this benefits iOS users in the long run, and despite the unmistakable similarities, Ham on the Run is a well-made, light-hearted runner that packs hours of fun within a tiny 39.5MB package. Oink, Oink. 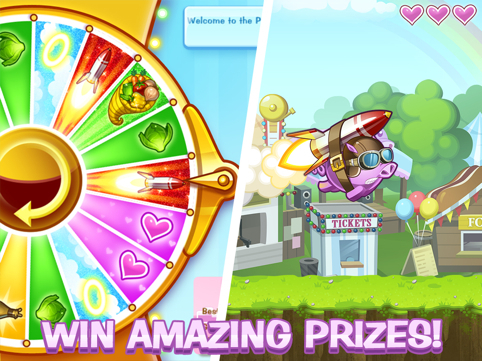 What's Hot: Free-to-play and highly enjoyable, spinning the prize wheel, charming county fair theme, in-game achievements, cool upgrades and items. What's Not: Does nothing to advance the genre.